It's cold. I'm cold. I have a cold. So let's distract ourselves with a little Movie Madness Monday, the movie quote trivia game! Here's the lay of the land: I give you quotes from a movie, and you respond in the comments section with a quote or two of your own from the same movie without naming the movie. Okay? Let's go where my friend Julie is right now! Darn her. "You know you can't read." "It's the Bible! You get credit for trying." "I'm afraid currency is the currency of the realm." "We are very much alike, you and I, I and you... us." "Oh. Except for a sense of honor and decency and a moral center. And personal hygiene." "The dichotomy of good and evil." "Na-na-na-na-no-no no! 'Krah-ken''s how it's pronounced in the original Scandinavian, and 'Krakken''s closer to that. "Well we ain't original Scandinavians, are we? Kray-kin." "It's a mythological creature, I can calls it what I wants!" Off ya go, now, poppet! 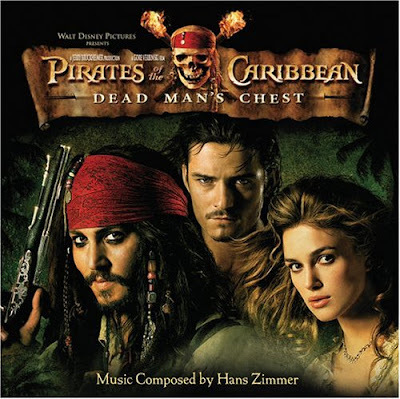 PIRATES OF THE CARIBBEAN 2: DEAD MAN'S CHEST! Look how pretty they all are! And check out Bil Nighy as Davy Jones! Can't wait for number 3 to come out this summer! Wow, I have no idea, but based on these quotes I have to see this movie! I love those moments! I like to wave at them as they pass by. [Sniffs armpit and looks back] "Trifles." "Dirt. This is a jar of dirt." "If ya don't want it, give it back." [Turns away, hugging jar to his chest] "No!" P.S. Got it on the first quote you left. Quoted it once, myself. In a drunken stupor, course. "Why is the rum always gone? I have every faith in your reconciliatory navigational skills, Master Gibbs. "Do you think I wear this wig to keep my head warm?" "Fine! Let's just haul out our swords and start banging away at each other! That will solve everything!!!" Best scene? When she chains the captain to his ship..."Pirate." I'm pumped for the final chapter. "Let no joyful voice be heard! Let no man look up to the sky with hope!" Y'all are doing SO well! It warms the cockles of my heart. There's still plenty more to go around. And ruth, you absolutely have to see this movie! "No... we just made it angry." I confess, I had to search for the lyrics you left on my site. I'll even confess s'more: I search for lyrics to LOTS of the songs I use for post titles. But I do have an awful lot of lyrics floating in my head. Like today? For no reason? Couldn't get "La Bamba" out of my head. And I probably haven't heard it in years. That's okay, but you really need to listen to more Joni Mitchell! And I loved the Jamiroquai quote. I am soooo bad at this! I did see the movie(s)- one of them at the drive in. When I search for a quote, though, I come up completely dry.